We have new start up as "Design Era Solution" in College of Engineering, Pune. We are engaged in the providing service of subletting of RCC, Steel, and Pre-stressed Design & Drafting works. In the domain of civil engineering outsourced services, we offers turnkey engineering, drafting and documentation solutions. Our engineering outsourced solutions cater to extensive planning, designing of all types of structure. With our strong analytical capabilities we can go to the root of any type of project and deliver the highest quality and error free construction drawings in a realistic time schedule. We utilize latest technology to provide our clients with services to meet their continually increasing expectations. At Design Era you get nothing but the best. As a structural engineering firm, Design Era stresses on internal training and imparting cross-functional duties to learn more. 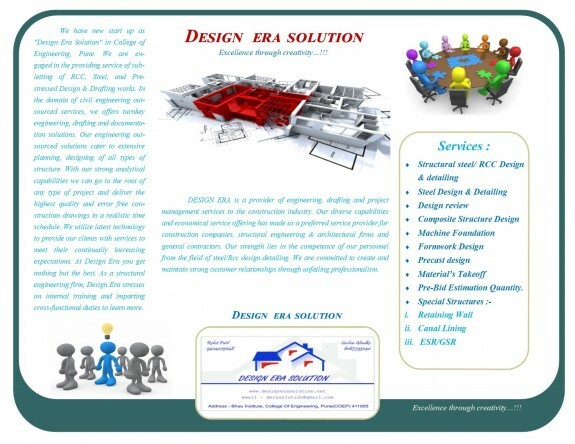 DESIGN ERA is a provider of engineering, drafting and project management services to the construction industry. Our diverse capabilities and economical service offering has made us a preferred service provider for construction companies, structural engineering & architectural firms and general contractors. Our strength lies in the competence of our personnel from the field of steel/rcc design detailing. We are committed to create and maintain strong customer relationships through unfailing professionalism.